Is the American Staffordshire Terrier right for you? The American Staffordshire Terrier breed is well known for their courage, loyalty, and tenacity. Amstaff dogs have a strong protective instinct around their families, so it is important to socialize them as pups. The American Staffordshire Terrier is often mistaken for their close cousins, the Pitbull. Originating from the Staffordshire Bullterrier of England, The American Staffordshire Terrier was developed to be an incredibly muscular, active breed. Bred to have a bigger, more powerful head than their English counterpart, these dogs often get a bad reputation for incidence of violence due to their incredible power, and while they are capable of massive amounts of damage, it is their owners, and not the dogs, upon which the onus of these events should lay. 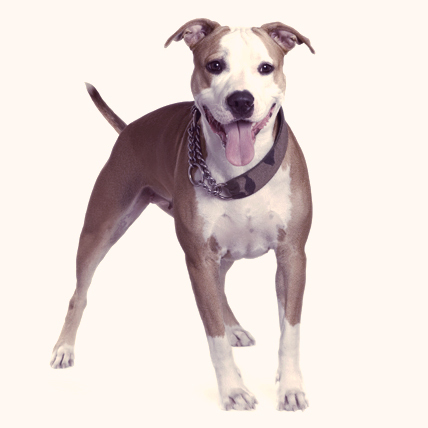 An offshoot of the American Pit Bull Terrier, or vice versa, this is the show dog portion of the family tree, and their Pit Bull cousins are the sport-based branch. The American Staffordshire Terrier was recognized by the AKC in 1936. The American Staffordshire Terrier is almost frighteningly strong, looking like a fur coat packed full of muscles. They have a head that looks like it could bust through a wall and their body is low and wide, giving them the appearance of a linebacker that is blocking for a tackle. Their jaw is incredibly strong and their lips should be close, with little to no jowel. On average, they should be bigger in head and body size than their cousin the American Pit Bull Terrier. The American Staffordshire Terrier is a bright, well tempered, outgoing breed that loves to please their owner. Great with kids and adults alike, these dogs make for great family pets. Due to their high threshold for pain, these dogs can be very dangerous if not properly socialized, since, just like any other dog, they have the capacity to get unruly. But unlike other breeds, when an Am Staff does, they can deliver quite a payload. Should their family act like a functional pack, with a strong pack leader (that isn’t the dog), the Am Staff is one of the most well rounded breeds available. The American Staffordshire Terrier can be black and white, red and white, fawn and white, blue and white, and even brindle and white.